The new study observed 23 macaques in a number of groups of different sizes. 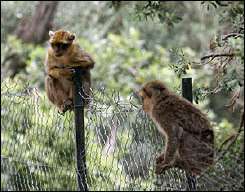 The monkeys were kept in their groups for an average of over a year, and a minimum of two months. One monkey was alone in its cage, but in all the other groups, which had from two to seven individuals, a heirarchy developed in which an individual's rank depended on the monkey's ability to form successful social interactions, such as friendships and partnerships. The study used magnetic resonance imaging (MRI) to compare the brains of the monkeys, and the results showed that in the temporal areas of the brain associated with social interaction skills, around a five percent increase in the volume of gray matter was found for each additional group member. The regions of the brain that increased in volume included the temporal pole, temporal cortex, and the inferior and rostral temporal gyri. The researchers also compared the brains of male monkeys at various levels in the dominance-based heirarchy and found a number of brain areas, particularly the prefrontal cortex and inferior temporal sulcus, were enlarged in males of higher rank. The research demonstrated that the social networks caused the changes in the brain (rather than enlarged brain areas influencing position in the social network, or the size of the network) because the scientists manipulated the size and makeup of the groups over a period of several months, and observed the changes in the brains of the monkeys. Earlier research has shown that the brain shows plasticity, which means it can change in volume in different regions in response to environmental changes or acquisition of new skills or knowledge. Research had not previously shown brain plasticity in relation to social networking skills. The paper was published in the journal Science on 4th November. OK, next time a rhesus wants to friend me on Facebook I'll say yes ~ his/her grey matter depends on it!! !